ALL ABOARD THE SCENIC BIKE TRAIN! Step back in time and enjoy a relaxing 25 mile train ride through the Lehigh Gorge. 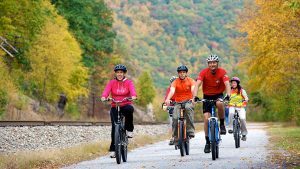 Then, pedal your bike back down to Jim Thorpe at your own pace along the Lehigh Gorge Rail-Trail. 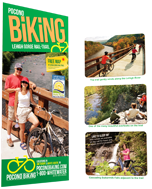 Begin your day in Jim Thorpe, where you and your bike will board the Lehigh Gorge Scenic Railway. You will enjoy a one hour ride as the train swings onto the former Lehigh Valley main line and passes Glen Onoko, the southern gateway to the Lehigh Gorge State Park. While you sit back, relax and take in the outstanding scenery, the train will follow the winding Lehigh River for 25 miles. You’ll round curve after curve until you reach the village of White Haven. 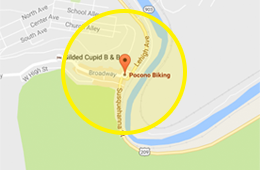 Here, you and your bike will be dropped off at the Lehigh Gorge trailhead. If you don’t have a bike or don’t want the hassle of bringing your own, no worries – just rent one of our Trek bicycles. The Bike Train runs at 9AM and 12PM today. Click here for additional dates! 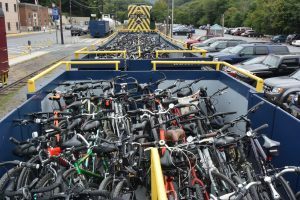 Bike Train Reservations are necessary and can be made by calling Pocono Biking at 570-325-3654.